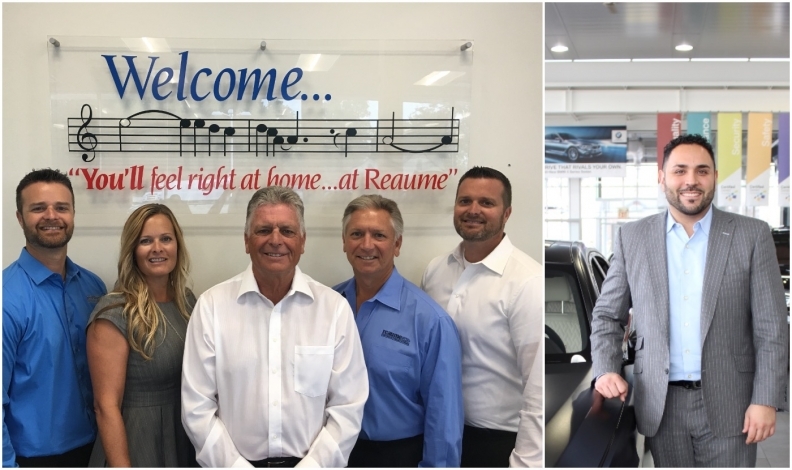 The Reaume family, from left, Craig Reaume, general parts and service manager; Jennifer Reaume, general manager; Steve Reaume, general consultant/ retired dealer; Richard Reaume, secretary-treasurer; Jeff Reaume, dealer principal, general sales manager, stayed small. But Zeyad Rafih, vice-president of group fixed operations, Rafih Auto Group, said the company is looking to grow. WINDSOR, ONT. — Jennifer Reaume and her two brothers had the opportunity “a while ago” to add a second dealership, a move that would have made Reaume Chevrolet-BuickGMC of LaSalle, Ont., part of the trend toward consolidation in Canada’s dealership system. “In [neighbouring] Amherstburg, a dealership came up, and we went through the process. We thought because there’s three of us, it wouldn’t be a bad idea,” Reaume said, referring to brothers Jeff and Craig, who help run the fourth-generation dealership. At a rival Windsor-area dealership, Rafih Auto Group, it did end up happening — again and again. “We’re constantly looking to grow,” said Zeyad Rafih, vice-president of group fixed operations. Recent acquisitions by the 16-dealership group include stores in the Greater Toronto Area. The numbers across Canada suggest consolidation is less a trend and more likely an imperative as the population ages and the costs of renovating stores rise. While nine per cent of all new-vehicle sales in Canada were handled by group-owned franchised stores in 2000, by last year that number soared to 58 per cent, according to statistics compiled by DesRosiers Automotive Consultants. The boom in mergers and acquisitions caught the attention of Farid Ahmad, founder and CEO of Markham based Dealer Solutions North America Inc., in 2012. Ahmad had been providing talent-recruitment services to auto dealers since 1998, when he began getting requests for help understanding how much the dealerships themselves were worth. Since then, his company has been involved in 158 transactions, making it the largest in Canada by the number of deals. The average value of the transactions Dealer Solutions represents is $8.5 million. Most of the time, the company represents the sellers. “Typically, people who are selling may not have the experience because it’s been a family business. They don’t understand all the steps and the pitfalls that are going to happen in a selling process,” Ahmad said. Sellers’ top concerns are confidentiality, factory approval, the buyer’s ability to pay, severance costs and what to do with the proceeds, he said. “We take a selling client and hold their hand through all the ups and downs of the process,” Ahmad said. Valuations are down slightly from their peak in 2016, he said, as buyers have become pickier about brand and location. But it’s still a very active market, said Ahmad, who expects to close 40 more deals this year. Some of the nearly half-dozen rivals within an easy drive of the Reaume family’s dealership have formed large dealer ownership groups, a decision that industry advisers say can help owners raise money and cut costs. But Jennifer Reaume, the dealership’s general sales manager, said the family sees no need to join the rush to bulk up. Instead, the Reaumes have focused on expanding their existing dealership, adding more floor space and more brands. Until the auto crisis of 2008, the business begun by her great-grandfather specialized in Chevrolet. But the massive restructuring at General Motors — after which many dealerships closed — provided an opportunity to add Buick and GMC, she said. At Rafih Auto Group, in contrast, the company’s reach extends well beyond its Windsor base. The company, founded by Terry Rafih in 1985, sells 25 brands among its 16 stores, including Toyota, Chrysler, Land Rover, Lexus, Honda, Mercedes-Benz, Chevrolet, Buick and GMC. “You get a lot of economies of scale when you grow your company to that size,” said Zeyad Rafih. Industry experts said the pressure to consolidate is coming partly from the brands. Automakers are demanding that dealers invest more heavily and more often to spruce up their showrooms, increasing the costs and potential risks for owners. The Reaumes’ dealership is no exception. “When GM says to you, ‘Do it,’ yo do it. It’s part of the image program,” Jennifer Reaume said. She said she understands the desir of many auto dealers to “monopolize the market” by buying rival locations and brands. But the competitive pressures aren’t quite as steep in a small bedroom community such as LaSalle, Ont., where the Reaumes’ business is based.